This may not bother everyone as much as it bothers a dog walker, but there is nothing worse than a soggy leash wrapped around your neck, or even your wrist for that matter. I love these Tilden Leashes by OllyDog because they are stink-proof, waterproof, and flexible enough to be comfortable around your wrist and in your hand. They come in fun colors and last for years! These are probably my #1 must have item for dog owners in Seattle. If you're dog plays outside and gets wet and muddy, you need this collar! Have you ever noticed that sometimes the stinky dog actually isn't stinky, it's just the collar? Dublin collars solve that problem entirely! The collars are sturdy rubber, stink proof, waterproof, easy to wash and perfect for Seattle. In my opinion, every active outdoorsy dog needs one of these. I am so adamant about them, I actually bought them for all of my clients for holiday gifts one year. The Soggy Doggy doormat may not seem like much, but it piqued my curiosity enough to try it out. I was really surprised with how well it worked! I got two of them for our boat. The dogs (and us) track in so much water from the deck into the cabin and before you know it, the whole floor is wet. These mats are so absorbent that with just one step on the mat, the paws come off onto the floor dry and clean. It's pretty incredible! Their a small (and I think local?) company, and definitely worth a try! The Furminator FurDry Wrap Towel is kind of a joke and kind of genius. 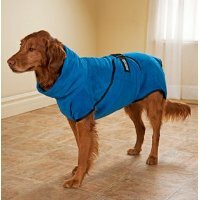 It's like a bathrobe for your dog. It solves the problem (mostly) of the wet dog jumping on the couch, or getting their bed all soggy. You just wrap them up and let them hang out. By the time you take it off, they are fluffy and dry! I think this would be especially useful for the Golden Retrievers and any other long haired dogs. Yes, they look pretty ridiculous, but a rubbing them with a towel can only get them so dry, believe me, I am a pro! Give your dog a space to dry off - whether it is a laundry room, a gated off kitchen, or a crate, it helps everyone to know they aren't going to jump straight onto your white couch. If you use a non-waterproof leash or collar (such as the Wonder Walker harnesses), throw them in the wash once a week to keep the stink away. Posted on September 5, 2013 by ballwalkpark and filed under products and tagged dog park muddy paws seattle rain rainy dogs soggy dogs soggy doggy ollydog muddy dogs dog walker waterproof leash waterproof collar dublin collar clean dog. Cozy Caves for Christmas - 50% off today! Go ahead and cross one thing off your holiday shopping list! Posted on November 25, 2012 by ballwalkpark and filed under products and tagged ballwalkpark best dog walker christmas Cozy Cave dog dog bed dog crate dog health dog park dog walker dog walking dog walking clients dogs in snow dogwalker french bulldog Frenchie pet puppy in snow Queen Anne queen anne dog walker Queen Anne dogwalker seattle dog seattle dog walker Seattle dogwalker seattle snow snow storm vizsla vizsla puppy. Miles, Bailey and I just found our new favorite toy: NiteIze Innovation Meteorlight K-9. It is a rubber ball that lights up when you push it. This ball is perfect for Seattle winters when it gets dark out at 4pm. I don't know about your dog, but Bailey loses way too many tennis balls when it is dark out, and she rarely loses a ball! The ball is powered by an LED light and it changes colors as it flies through the air. The dogs had no trouble finding the ball in the pitch dark and I was constantly entertained watching the changing colors bouncing through the dark. I bought the meteorball at the Queen Anne All The Best. They said they've heard from others that the battery lasts about 3 months. I have hesitated buying this ball for so long because it is $11.99, which in my mind, is outrageous for one ball, but if the dogs can see this ball and we don't lose it, it may be cheaper than losing numerous orange rubber balls! Posted on November 24, 2012 by ballwalkpark and filed under products and tagged All The Best ballwalkpark dark at 4pm dog balls dog park dog toys dog walker dog walking dogwalker glow in the dark ball meteorlight k-9 Queen Anne queen anne dog walker retriever retrieving Seattle Dog Park seattle dog walker seattle winters vizsla. Start crating your pup early and they will soon love their "house" in no time. I always suggest to give a special treat or Kong filled with peanut butter each them they go in their crate. There are many options for bedding available, personally, I like to put a big fluffy blanket or bunch of towels so the puppy can kind of nest and get cozy, and also get used to my smell even more. Plus it's easier to wash frequently than a dog bed. New puppies may have a hard time sleeping through the night at first b/c they miss the heartbeat of their littermates. This pillow mimics the sound of a heartbeat. Or you can go the old fashioned way and buy a ticking alarm clock at Bartell's. Also you can put a Nalgene bottle of warm water in the crate so it feels like a warm body next to them. When not in the crate, make sure your pup is in confined areas so you can keep an eye on them! There are a ton of good puppy foods out there, and majority of them will be grain-free. Talk to someone at your local pet store to help you decide what is best for your pup. I like to go to Mud Bay Granary, All The Best or Petapoluza. Nick at Petapoluza is especially knowledgable and helpful about dog foods and only carries the highest quality labels. These treats are great because they are easy to break into small pieces for little puppy mouths and lots of training, and they don't smell horrible but the pups love them! Be it a treat pouch, a ziploc in your pocket, or just a pocket full of treats, make sure you are armed with treats at all times! You want to always be prepared to reward your pup for all the new behaviors he is learning! I don't know what it is about this toy, but pups seems to love it! This little ring gets soft and gummy for young puppies teeth. Bambi lived on these for several weeks. This is a great toy to stuff with treats when you put your pup in their crate. This is a ballwalkpark puppy gift basket classic. Everyone loves a squeaky hedgehog! Until the squeak drives you crazy.. The squeaky bee is another ballwalkpark classic. The bee is smaller and easier for pups to hold onto. Still soft and squeaky fun! Accidents will happen. If your puppy can smell where the accident was, they will be more likely to have another one in the same place. This enzyme cleaner takes away all of the smell better than anything I've found. It's also ultra concentrated so a little goes a long way. You can find it at Mud Bay. We are in Seattle. Muddy paws are an inevitable part of life. This ultra-absorbent towel will make your dry-off job that much easier. Run this bone under the water, put it in the freezer, and give to your pup for some soothing relief. A must-have for leash training! Check out my blog last week about the Wonder Walker body halter here. I like this leash because it has a handle close down to the dog's neck also so you can keep them on a short lead at corners, cross walks, or in crowds. Bailey and I used this thing walking around Greenlake every single day for almost 4 years. 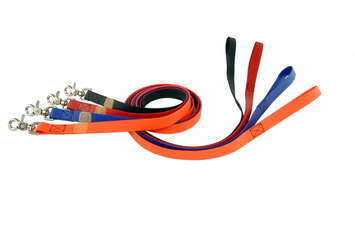 Whether it's this leash or not, I highly recommend a flat nylon or rope leash as opposed to a retractable leash. Pretty much the greatest invention ever. My profession pretty much relies on this handy little tool, considering I can't throw more than ten feet on my own... A great way to exercise your pup once they are a little older! A QR code ("quick response") on a pet ID tag links to your pet's online data to show emergency contacts, medications, dietary information, and much more. Modifying your data is immediate, free, and does not require a modification to the physical ID tag. Health Insurance is a MUST! Rates are reasonable, starting around $25-$30/mo depending on breed and depending on which plan you choose you can receive up to 90% of your vet bills back on accidents, illnesses and genetic problems. Healthy Paws is a great local Seattle company. I have had nothing but wonderful experiences with them and highly recommend! Click the image below to save 10% off FOR LIFE! Posted on April 7, 2012 by ballwalkpark and filed under products and tagged new puppy products new puppy shopping list puppy puppy shopping list Queen Anne dogwalker queen anne puppy seattle dog stores Seattle dogs seattle puppy. The Wonder Walker is much safer alternative to choke chains, and even a flat collar if your dog pulls. This harness can be used on any dog, of any age. Which brings me to another reason I am such a fan - if you start using this harness on a young puppy, you teach them the right way to walk from the beginning and eliminate pulling as a problem before it even starts. The Wonder Walker comes in a ton of great colors that you can custom order. Another reason to love this company? It is local, based in Seattle! Explains why almost every dog walking up and down Queen Anne Ave is sporting one these days. I have bought mine at All The Best on Queen Anne. **I am not given any incentive to write about this harness, I just really like it and want to share with everyone! Posted on April 2, 2012 by ballwalkpark and filed under products and tagged All The Best dog harness dog training dog walking dogs Queen Anne Seattle dogs Wonder Walker.